My 10 year old Dewalt DW733 thickness planer decided to consume it’s motor belt this weekend. I was thicknessing some cherry stock for a sideboard that I am building when the planer began to make a loud clunking noise. A few minutes later it spit chunks of partially melted beige rubber out at me and stopped cutting. 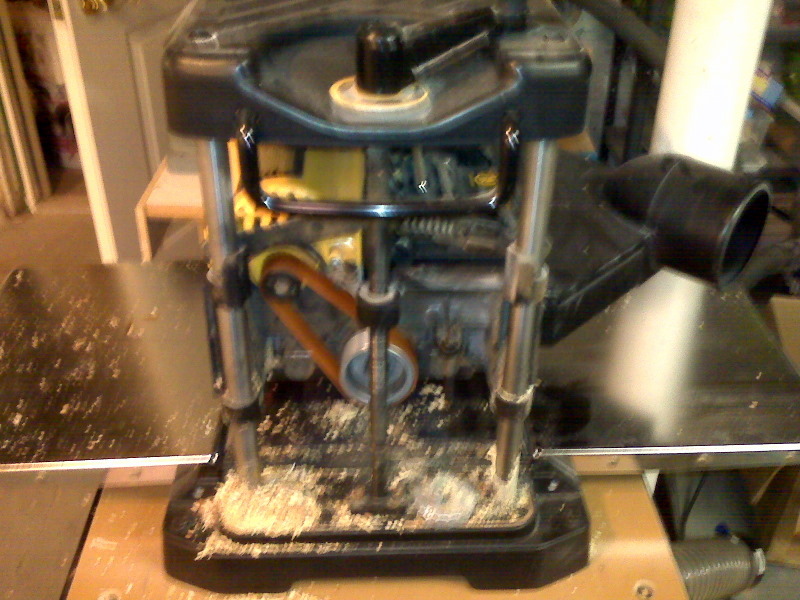 The side cover of the planer was easily removed, and I can find nothing wrong other than the disintegrated belt. I ordered a new one from Dewalt ($27), and hopefully that will fix the machine when it comes in. Until then, the project will have to go on hold. Photo above is the unit with the side off and new belt installed. Posted on October 13, 2009, in Tools and Shop. Bookmark the permalink. 2 Comments. where can i find instructions on the dw733??? ?